Lee Myung-hee, wife of Korean Air Lines Co. chief, on Monday appeared for questioning once again, this time over allegations that she hired housekeepers from the Philippines without due visas. 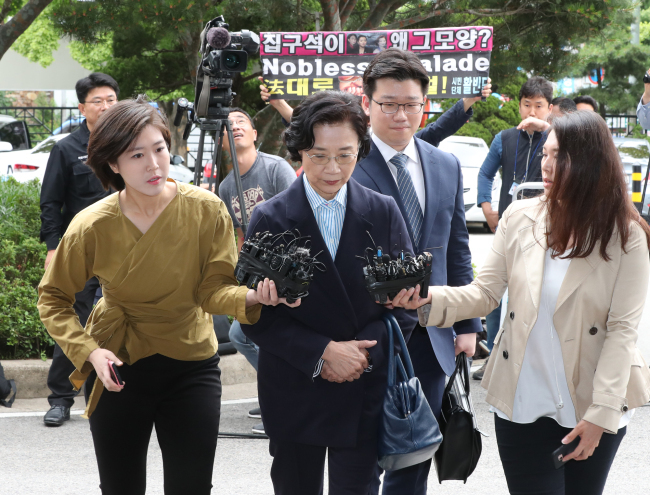 Lee, 69, arrived at the Seoul office of the Korea Immigration Service at around 10 a.m.
She is accused of hiring some two dozen maids from the Southeast Asian country for at least the past decade by sponsoring them with traineeship visas in violation of the law. To work as housekeepers in Korea, a foreigner must obtain a visa that is issued to either ethnic Koreans from overseas or those who married Koreans. The authorities suspect Lee had the airline's human resources department and its Manila branch recruit the housekeepers. Korean Air officials from the two offices have also been questioned by the immigration investigators. Monday's interrogation comes after she was grilled by police twice in May over a raft of assault charges. She avoided an arrest as the court turned down her warrant last Monday. She's been accused of habitually cursing at and shoving employees of Hanjin, Korean Air's parent firm headed by her husband and Chairman Cho Yang-ho, and some construction workers hired to remodel her mansion.